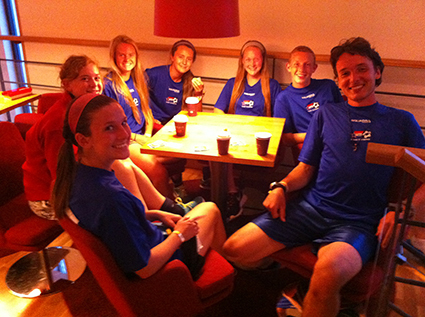 Big day at Gothia Cup as we finish group play and head into playoffs. Girls 17 start us off with a 5-0 shelling and finish 2nd in their group and advance into the A-final bracket. Goals from Dana McAlpine, Katelyn Havard, Nicolette Casarcia, Zoe Peterson, and Britteny Sanders. Boys 16 follow suit as they won 3-0 and end up winning their group which is a great feat. 2 goals from Donovan Smith and one from Cory Wright led the way. Boys 18 up next and just cannot catch a break as we tie once again 1-1 and give up a lead this time. Chase Gaskill scored a great goal, one of the best on tour so far. 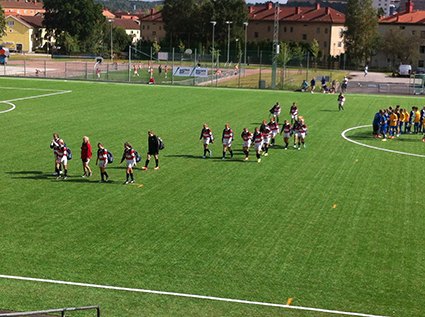 Girls 19 finish our group play versus a tough Swedish team and lose 4-0 but they are playing much better. Now to win or go home and Girls 17 play a tough Norwegian team, go down 1-0, tie it up on a great goal from Katelyn Havard, and then give up a goal 10 min from the end. So we lose 2-1 and are out, but they fought hard and for that I am very proud. These girls are tough. Boys 16 play the match of the tour so far as they played a very tough and talented Swedish team and we were fortunate not to be down by 3 goals in the first 10 minutes. 0-0 at half and then Donovan Smith scored a rocket and we held on with some great organization. Josh Engler made a solo run and gave us an insurance goal as we steal a victory against a very good team 2-0. Thats why we play these games out and the boys are stoked. Weather was awesome, between 65-80 and sunny as well. Kids are sore from all of the training, games, and of course walking, but we soldier on. Another great dinner and then the kids have their phones for a few hours so they are happy happy happy!! !